Fifteen pound bird, brined overnight, 0745 into the ASSC - see the photo for the explanation of Long Shadow. Internal temp of the bird was 46º. At 1245 the thermometer was reading 167º. The breast was just separating from the bone, the white meat was tender and moist.Not a hint of dryness. So 5 hours of cooking or 20 minutes per pound - which rivals a conventional oven - and on the table for a 1400 dinner. Wow Jim, starting at 7:45 AM at this time of the year, that is great. And to cook a turkey at this time of the year with the sun so low on the southern horizon is also spectacular. 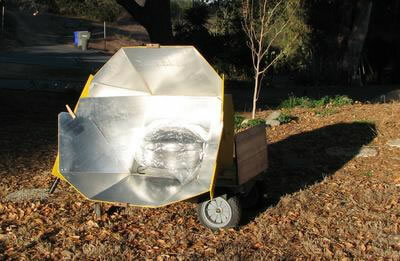 Your All Season Solar Cooker does a great job. That's great, and very impressive!